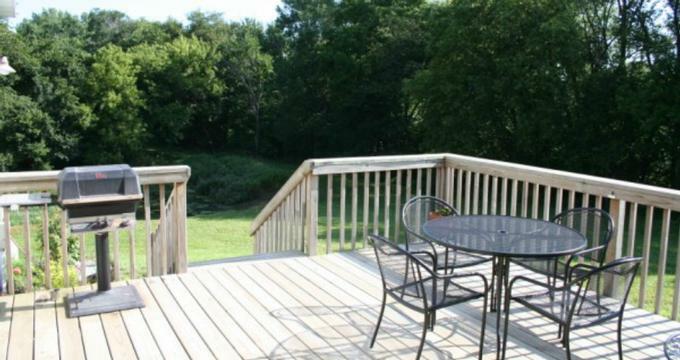 Set on the southeastern edge of a working 80-acre farm and vineyard outside Des Moines, IA, Victoria's Vineyard Bed and Breakfast gives visitors a taste of laid-back Iowan country life in a peaceful setting. Located a short drive away from the Adventureland Amusement Park and the Prairie Meadows Casino, Victoria's Vineyard Bed and Breakfast feature two bedrooms on the upper and lower of the house with sumptuous furnishings, private bathrooms with Jacuzzi tubs, and modern amenities. The home has comfortable communal areas where guests can relax like a spacious sitting with sofas and armchairs, an outdoor deck with a barbecue grill for alfresco dining under the stars, and beautiful gardens, vineyards, and a tranquil pond. There are several hiking trails winding through the surrounding 30-acre hardwood forest, and guests can spend lazy afternoons picnicking and swimming in the small lake. Victoria's Vineyard Bed and Breakfast feature two well-appointed bedrooms on the upper and lower of the house with sumptuous furnishings, private bathrooms with Jacuzzi tubs, and modern amenities. The master bedroom is located on the top level of the house and features a king-size pillow-top bed dressed in high-quality linens, down comforters, and plush pillows, and an en-suite bathroom with a Jacuzzi tub for two, a single vanity, fresh towels and a luxury bathrobe, and branded bath products. The second bedroom is located on the lower level of the house and has a queen-size pillow-top bed dressed in high-quality linens, down comforters, and plush pillows, and an attached bathroom with a shower/bath combination, single vanity, fresh towels and a luxury bathrobe, and branded bath products. Modern amenities in both rooms include flat-screen televisions with cable channels, coffee makers, telephones, irons and ironing boards, hairdryers, and complimentary wireless Internet. A complimentary breakfast is served every morning in the elegant dining room and includes freshly baked bread and pastries, seasonal fruit, cereals and homemade granola, yogurt, fruit juices, freshly brewed coffee, and tea. Gluten-free, lactose-intolerant, vegetarian, and vegan diets can be accommodated on request. The house has comfortable communal areas where guests can relax like a spacious sitting with sofas and armchairs, an outdoor deck with a barbecue grill for alfresco dining under the stars, and beautiful gardens, vineyards, and a tranquil pond. There are several hiking trails winding through the surrounding 30-acre hardwood forest, and guests can spend lazy afternoons picnicking and swimming in the pond. Victoria's Vineyard Bed and Breakfast is located on a working 80-acre farm and vineyard on the north-east outskirts of Des Moines and is within a short drive from several attractions in the area, including the Prairie Meadows Racetrack and Casino, the Adventureland Amusement Park, numerous breweries, restaurants, and wineries. The inn’s sitting room offers a comfortable space for gatherings such as small parties and celebrations and business meetings. Decorated in vibrant hues of red and yellow shades, the living room features ample seating, tables and chairs, and a flat-screen television and state-of-the-art sound system.